What’s on your back burner? Poll: Planning a weekly topic-focused blog – what would you like to read more about? 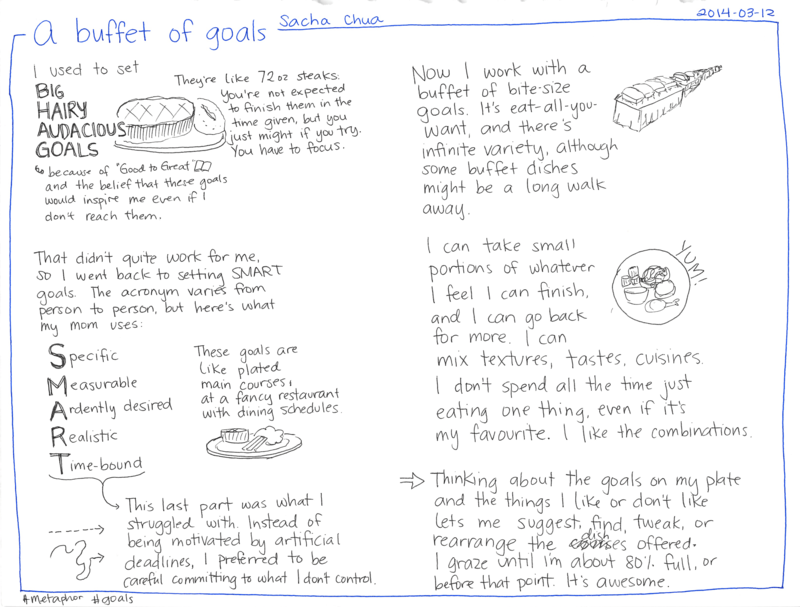 I started by drawing different goals and their connections with each other. For example, I like learning more about tools and programming languages because that helps me build more tools and cool stuff, and that tickles my brain. It also gives me useful things to share, and that helps me make technical topics friendlier. Sharing also helps me connect with other people, which makes it easier for me to learn from different perspectives, which enables me to make better decisions. Many of my actions and goals support more than one goal, so I get a lot of value out of the time I spend. I picked a set of goals and listed the actions that I frequently take towards those goals. I also brainstormed different actions that I could take or delegate. 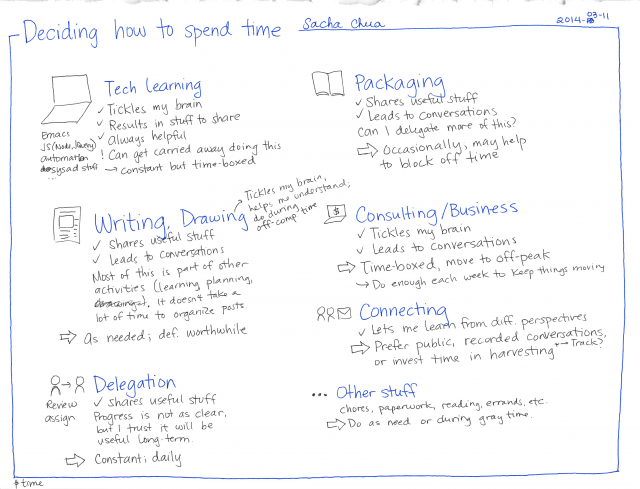 This was great because it helped me come up with more ideas for mini-projects or delegatable tasks. For example, a weekly Emacs tutorial might be fun and useful (and maybe I can even commission some of those). I can look into asking my assistants to interview me as a way of fleshing out particular post ideas, too. One of the advantages of making a list of productive activities is that it’s easy for me to switch from one good thing to another depending on my interest or energy. Since “Tickle my brain” turns out to be a totally acceptable goal (at least for me), I can give myself permission to spend one or two hours a day on tech learning. That had been neglected because of my focus on other activities. It’s good to get back into tweaking my Emacs or learning more about NodeJS, though. I can get a little carried away doing this (flow can be dangerous! ), so I limit my time. After about two hours each time (or maybe four, if I’m pushing it), I should resurface and check on the other activities I may need or want to do. It’s good to decide how much time I want to spend on other activities, too. For example, I want to work on delegation daily so that my assistants get prompt feedback and so that I keep filling the pipeline with more task ideas. I want to work on consulting enough so that projects and tasks keep moving, but I don’t want it to take over peak creativity/attention time, so I move it off-peak whenever possible. Packaging (making PDFs and e-books, organizing and revising posts, recording and processing podcasts) takes time and isn’t as engaging as the other activities, but it helps me connect with people, so I should do that weekly. I’ll also see if I can delegate more packaging so that it gets done. 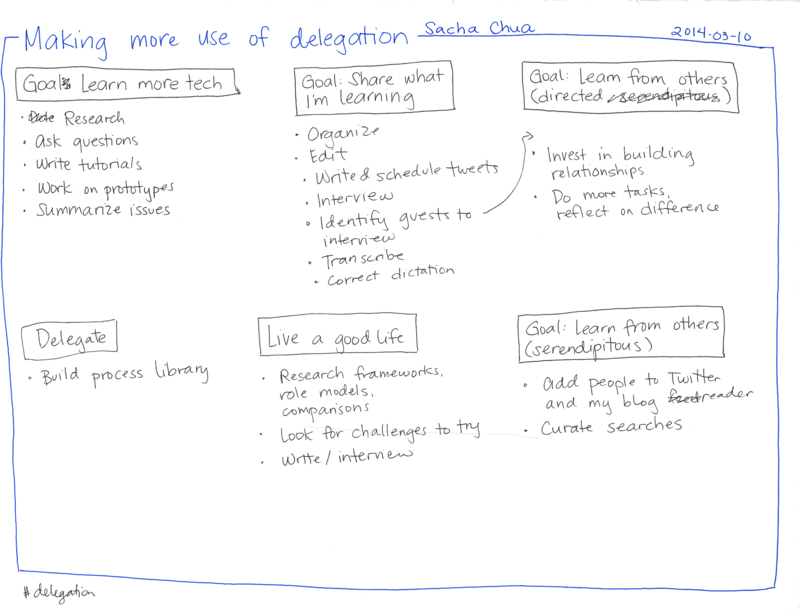 To make it easier to brainstorm delegation-related tasks, I pulled some out into a separate drawing. There’s a lot of room for growth. =) I’m slowly getting used to having assistants do web research, and it turns out to be surprisingly useful. I probably read much faster than they do, but I benefit from the different perspectives and search words they use, and it’s nice to ignore the fluff. 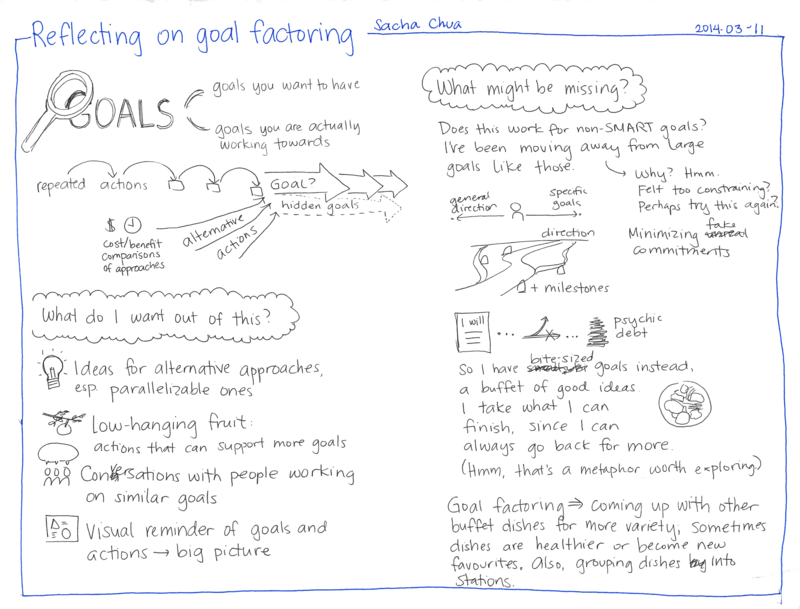 One of the templates for goal factoring encouraged you to analyze your current actions instead of getting lost in goals you think you should have. 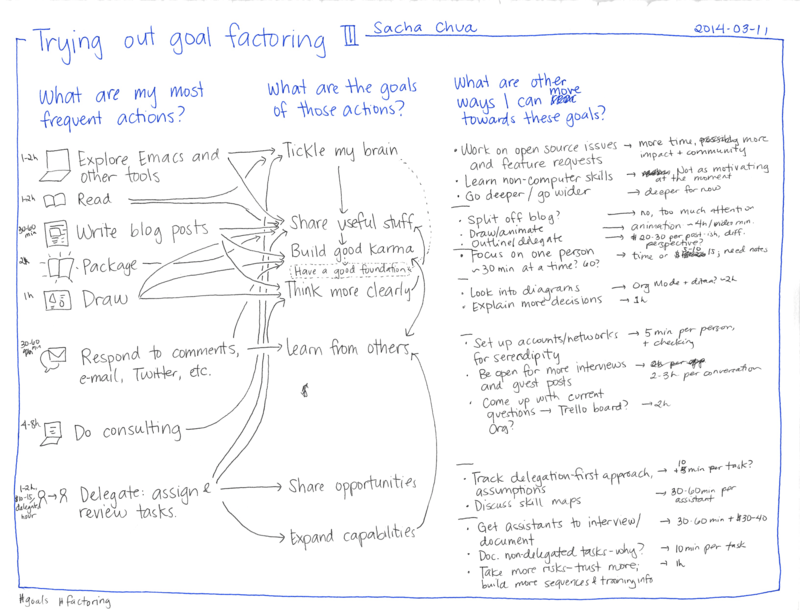 For my third attempt, I picked a few frequent actions and traced the connections to the goals they support. I brainstormed alternatives and compared the costs. The goals looked pretty similar to the first set, but a different perspective helped me identify other alternatives I can explore. For example, it might be a good idea for me to create a Trello board or update my public Org file with the things I’m curious about so that people can help me out. 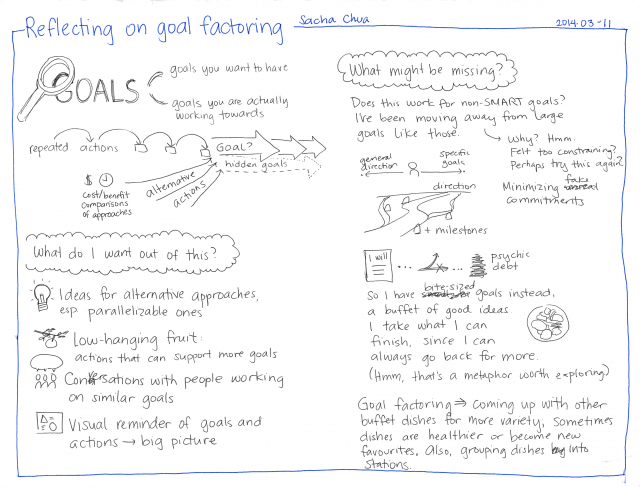 What am I learning from this goal factoring exercise? It’s a good excuse to brainstorm and examine alternative approaches for reaching my goals, especially in terms of identifying low-hanging fruit. 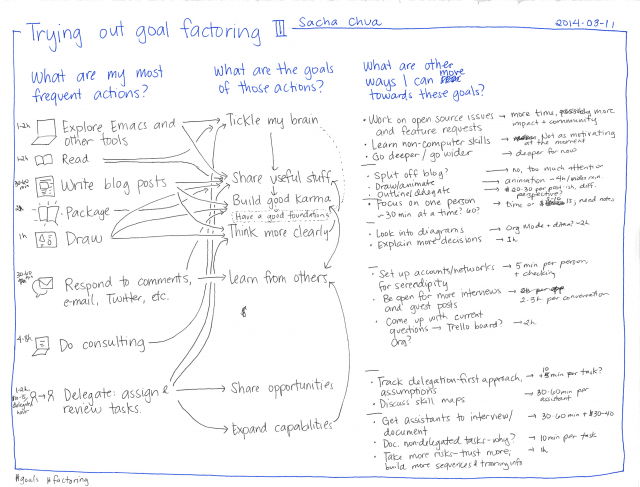 I’m already used to explaining how my actions contribute to multiple goals and how my goals are related to each other. I occasionally talk to people about my big picture (or as I like to call them, my Evil Plans). The way I define my goals seems to be a little different from the way most people define theirs. Instead of having big goals and strong commitments, I have a lot of small goals with hardly any commitment aside from curiosity. This approach seems to fit me better, although I’m probably missing out on extra productivity. I like making lists of lots of little goals or possible actions, because that makes the low-hanging fruit easier to pick. Time-boundedness was something that never quite caught fire with me, though. I think it’s because I’d demonstrated “potential” at an early age (of the computer-whiz-kid sort), grown up with praise along the lines of “Wow, she can do all of this stuff and she’s only ___ years old,” and nearly got caught up in the insecurities of looking over my shoulder or ahead of me at people who were doing even more awesome things at even younger ages. I remember consciously deciding, sometime in my teens, that I didn’t want age or speed to be special. People made a lot of fuss over precocity — but at the same time, it seemed that age became an excuse for them to not learn or try. I pushed back at that. I preferred looking up to late bloomers like Grandma Moses rather than the “30 under 30” lists. Self-imposed time-based deadlines–“I will do ____ before I turn 35”–echoed that old conflict for me. If a goal was intrinsically valuable, I would do it already motivated by the knowledge that life is short (memento mori! ); and if I wasn’t motivated enough to do it, I didn’t want to set myself up to feel like a failure just because I accomplished it at an older age instead of the goal I’d optimistically set. So I’ve been moving away from goals with deadlines. I wrote a blog post about that in 2012, but I’ve been thinking that way for a while now, and I’m coming to a clearer understanding. I want to embrace my goals and move towards them as a whole, motivated person, not split myself into taskmaster versus slave. I want to move towards my goals out of interest and curiosity and wonder. Dates might work for other people, but not quite for me. I have a lot of ideas, and it’s easy to get discouraged by the fact that I’m not making progress on as many of them as I want to. It’s simple math. If I make progress on two projects but let eight languish, I tend to feel guilty about those eight. Visualize: See what you’re working on and where it is in the workflow. Also, keep track of where you’re approaching the limits. Limit work in process: My limit is probably two projects in focus. I work on one at a time. The other is there for switching to if I hit a snag or need to change things up. (See also: Managing Oneself) Everything else is on the back burner, the someday/maybe list, or the “nifty idea but probably not for me” list. Manage flow: I’m not paying much attention to this yet. It would be interesting to track how things move from current to back burner. I have some of that data through my timetracking. Make policies explicit: What gets a project onto my someday/maybe list, onto my back-burner, or into focus? There are lots of ideas that I’m happy to let other people explore; I pick up only projects that I’m personally motivated by and that I see value in. Of those, I identify which ones I can actually make some progress towards today. I focus on 1-2 things that I like the most (especially if other people want them too). I don’t stop myself from working on back burner things, but I no longer have to feel guilty about letting them lapse. If it turns out that I don’t actually spend time on back burner items in a month or two, that’s usually a good sign it’s a someday/maybe thing due to lack of present motivation or capability. Implement feedback loops: I haven’t paid much attention to this yet. Usually, people nudge me if I let some projects take too much of my attention. Improve collaboratively, evolve experimentally (using models and the scientific method): Tweaking my mindset to minimize guilt-friction is a good, small improvement. Looking forward to other small improvements! Strict kanban would probably mean not even starting until I’d cleared off at least one work in progress, I think. I’m not that strict. I’m happy to switch back and forth, but it’s good to be clear about what I’m focusing on. That way, I don’t feel pulled in ten different directions. Writing is my key project. Drawing, Quantified Awesome, and Emacs swap in and out of the #2 slot. Delegation tends to be more on the back burners. Someday/maybe? More business stuff, getting better at gardening, learning sewing, and so on. If I were better at delegation, I might be able to increase my capacity to do more, but it’s a lower priority at the moment (I appreciate the extra cushion that frugality gives me). I’m cheating with “Writing” and the books on my list – I’m planning to write them in short segments, one blog post at a time. Knowing this helps because when requests come in for things that I’m not focused on, I can happily and guiltlessly refer them to other people. It makes decisions easier. Do I spend $X to attend a conference or course on Y? No, that’s on my someday/maybe list. It’s good to know what you can say no to in order to say yes to other things. Anyway, the point of this post is: I can’t do everything at the same time, so I’m learning to not stress out about it. =) If that’s something you struggle with too, then you might find that clearly identifying the things you are focusing on and gently letting go of the other things (at least for now) might help. Good luck! It’s easy to get discouraged by the vague feeling that you’re ignoring lots of things that you wanted to work on: hobbies that fall by the wayside, projects gathering dust on your shelves, Someday/Maybe lists that grow and never shrink. I’m learning that thinking about what’s on your back burner can help you make your peace with it, deliberately choosing what you want to work on during your discretionary time and letting go of the rest. I’m focusing on consulting this October and November. Assuming all goes well, December will be taken up by a vacation: wrapping up consulting, going on vacation, and recovering from the whirlwind. I’m going to be less “retired” than I thought I’d be at this point, so I want to be deliberate about what I’m putting on the back burner and what I should keep doing. Consulting leaves me with one or two days a week when I can focus on other projects. I also have little bits of time here and there, and some time in the evenings. What do I want to fit into those opportunities? Daily drawing: I really like this practice of thinking about ideas or questions on paper, and I plan to continue doing this. Since I’ve made it a warm-up and cool-down activity, I don’t need a lot of separate focused time for it. I draw to start and end my day, and I spend a little time filing new sketches. Decision: Continue doing this in small pieces. Visual vocabulary: Someone asked me if I could share my visual vocabulary with people. I had figured out a good workflow for building my visual vocabulary using other people’s sketches, but I didn’t want to share my 1,000+ term collection because it’s based on other people’s sketches (copyright, you know!). So I started building a new visual vocabulary using only my own sketches. 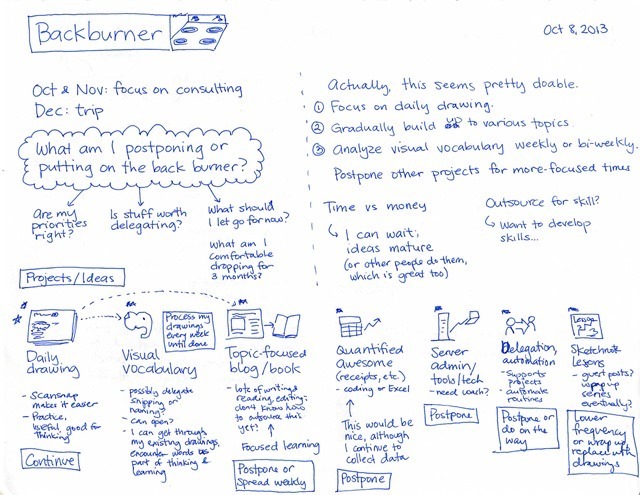 So far, I’ve processed all of my sketchnotes from 2013. The next step is to process my personal sketches (including my daily sketches) from 2013, and then start going backwards in time. Although the work was simple and not challenging, it was a lot of fun reviewing my past sketches and remembering what the talks were about. Decision: I’ll spend a little time on this each week. I thought about outsourcing parts of it, but it’s probably going to be easier, faster, and more useful if I do this myself. Quantified Awesome: I have bugs to fix, features to add, analyses to run… Well, the bug fixes come first. I’m going to set aside some of these focus days or weekends to get token authentication and a few other things working again. I’m curious about my groceries data now that I have more than a year of it, so I’m looking forward to crunching the numbers. Just how much rice do we go through in a year? How can we organize our space to allow us to stock up even better? Decision: Coding benefits from long periods of focus time, so I should use my free days for this. Once I get past the bugs, though, I’m okay with scaling back on this a little. Server administration, learning new tech skills: My web server isn’t set up optimally. It’s probably slower and more conservative than it needs to be. There are configuration options I haven’t dug into, performance limits I haven’t tested, and so on. Still, my server hasn’t fallen apart recently, and it should be fine for now. Learning new programming languages, frameworks, or platforms might also help me in the long run, but that’s something I can guiltlessly postpone for this quarter. Decision: Postpone, revisit next year. Delegation and automation: I keep wondering about how I might be able to take advantage of other people’s skills and experiences in order to learn more or do more, but I’ve been slacking off in terms of actually delegating things to people. I’ve been digging into why that’s the case (what are my excuses? am I missing some quick wins? ), so you’ll probably see a blog post about that shortly. Still, I don’t want to delegate for the sake of delegating. I want to make sure that I specify work clearly and can pay enough attention to give good feedback as well as learn from the experience. This takes time and brainspace. I’ll dig into this if the opportunity comes up, but I don’t mind waiting until later. As for automation, I’ll probably learn more about that on the way to doing other things. For example, AutoHotkey looks like it will repay further study. I’ll use some of my focus days to tweak things here and there, but I don’t need to push too hard on this. Decision: Postpone or do opportunistically. 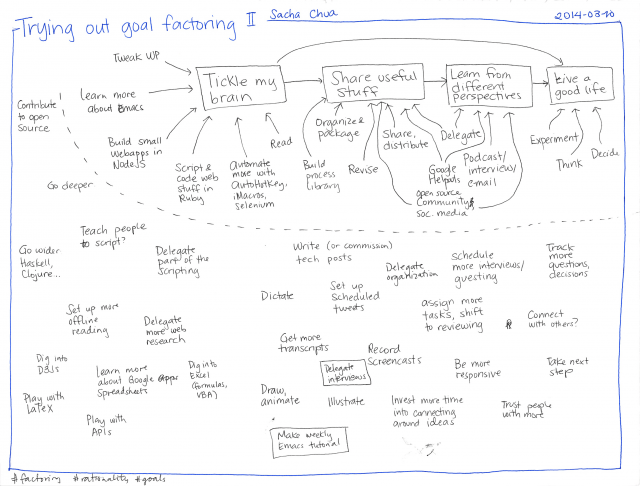 Sketchnote lessons: This is where I teach myself (and other people!) more about sketchnoting by drawing different variants of common techniques. It helps broaden my visual vocabulary. I currently publish a sketchnote lesson every Thursday. If I make it less formal and more playful, I might be able to fold it into my daily drawing / doodling sessions. For example, I might try drawing people in different professions or in different situations as a way of expanding my visual vocabulary. This does require a bit more research, though, because I need to look at other people’s sketchnotes and reference photos. If I relax my expectations of publishing and make it, say, once a month, then I don’t have to worry about scraping the bottom of the barrel. (I should do one just about metaphors… =) ) That way, if I end up ramping up my drawing/doodling so that I have something publishable once a week or once every two weeks, that’s awesome. Decision: Scale back a little, and focus on doodling different categories? When I started thinking about what’s on my back burner, I felt a little overwhelmed. There was too much to fit into my week, not to mention the stuff on my Things I want to learn list that I haven’t gotten around to even starting. As I thought about what I could fit into small pockets of time, what needed more focus, and what I could postpone, things felt more manageable. Now I have a few things I can focus on, and I don’t have to feel bad about temporarily letting go of some of the things I was curious about. We’ll see how this works! There will always be more things you want to do than time to do it in. You can get stressed out by your limitations, or you can exercise your ability to choose. Good luck! It’s good to think about the kind of life you want to grow so that when everything comes together – knowledge, skills, character – you can make the most of it. I recently turned thirty. This is great. Being a thirty-something carries a little more gravitas than being a twenty-something. It’s not a magic bullet, but I think it will help. Maybe in my thirties, I’ll get better at using the Voice of Authority. Maybe I’ll figure out how to stop sounding like I’m five years old. Maybe I’ll stop hedging my blog posts and conversations with maybes and probablys. I checked the mirror the other day. Still no crow’s feet. Gotta work on those. Every so often, I think about the way I want my face to wrinkle and age. Smile lines, yes. Frown lines, anger lines, not so much. Do you think it would be weird to find someone who can retouch one of my photos so that I’m more crinkly? Usually people want to go the other way around. Anyway. Growing older has its perks. While I wait for the aura of respectability to settle in, I’m working on accumulating knowledge and skills. They’ll come in handy someday. I was going to say, this girl looks like she’s 16, what does she know? … but she says she’s 29. A little better. I started up Happy Bootstrapper in April with no followers or authority. I planned to write a book about metrics first. The reason is simple – I know my metrics, but I’m not a growth consultant or a SaaS owner. Starting with simple info-products would have bought me time to grow my authority at the same speed with my products. Then I just happened to stumble into a problem/pain that I knew I could help people with. I didn’t stop to think if I had the authority to actually sell the product. And if you aren’t selling something trivial then you’d better have something to prove people that you know your topic. Teaching people about the topic does the job, but it requires time. Authority isn’t just for selling things. It can help when asking questions or sharing thoughts. It’s like the way open source mailing lists strongly encourage people to show their work when asking a question. Don’t just ask a question out of the blue, show how you’ve tried to find an answer on your own. Experience (even a little bit) earns you conversation. It’s also about making it easier for people to identify with you, which is essential if they’re going to listen. I did a lot of technology evangelism as a consultant, coaching teams and communities on social business and internal collaboration platforms. It was always about finding a few people within the group or in a similar group with whom people could identify. Few people were going to listen to me say that something was easy to learn. In many cases, I was the same age as their sons or daughters, and they were used to being confused by stuff that their kids found easy. If the advocate was someone in their group – especially someone who’s not always the first adopter of new things – it was much more effective. One of the most useful techniques for influencing people is Feel, felt, found: I know how you feel. I felt that way when… I found that… You can tell it with other people’s stories, but it’s more effective with your own. As I go through life, I’ll probably collect more experiences that can help me identify with people and vice versa. I’ll probably also diverge (like with this semi-retirement experiment thing! ), but with experience, I can get better at emphasizing similarities. It’s the ethos of rhetoric’s logos, pathos, and ethos: character is part of persuasion. What kinds of authority do I want to build? I want to get really good at learning and sharing. I want to grok things and share what I understand. I want to inspire and help lots of people learn and share more effectively. I want to get really good at working around my limits. That’s where Emacs, sketchnotes, Quantified Self, blogging, cooking, and introversion all fit in, I think. Emacs gets around the limitations of the tools I use. Sketchnotes and blogging help me get around the limitations of memory and introversion. Bulk cooking helps me get around the limitations of time. Quantified Self helps me get around the limitations of irrationality and forgetfulness. Not perfect, but useful. I want to get really good at living life with equanimity. I want to weather the ups and downs and sidewayses of life. Frugality is a subset of this, I think – the ability to resist the temptations of consumption and desire. So how can I build that kind of authority over the next few decades? Secondary insights come from reading, talking to people, and learning from other people’s lives. I can make the most of being close to a library and speed-reading like crazy. Decent fill-in while I don’t have much experience. If I can get a decade or two of great writing out right around the time I should have tons of experiences to write about, that should be fine. What kind of authority are you building? How are you going about it? My blog has a lot of different topics because I have a lot of different interests. The only challenge with posting daily is making myself stick to it instead of publishing two or three posts because I get carried away. There’s always so much to learn and share, and if I don’t write about it, I tend to forget it. I think it’s time to experiment with different ways to write. The variety is fine for other people with wide-ranging interests. The frequency is a little overwhelming, so I’ve started directing people to weekly and monthly updates. I’ve tried category feeds, but they’re still a little difficult to focus on if people just care about one or two topics. Please help me plan a new blog that’s more focused on a set of topics. =) One that’s updated weekly, so it’s more manageable in terms of reading. One that’s written for readers first, instead of being mostly personal notes that might be useful for other people. I’m still going to update my personal blog (sachachua.com) with all these notes, but once a week, I want to post a focused, well-written, illustrated, “I spent 4-10 hours making something useful for you” post that saves you time or money. I’m going to focus on general-interest topics so that I can write posts that might be useful for years and years to come. Tech-related posts can be difficult to keep current – people come across Emacs blog posts from 2008, and it can be hard to figure out what needs to be changed. General topics tend to be longer-lasting. Here is where I need your help and feedback: What do you want to read about the most? There’s a poll in this blog post. If you don’t see it, please check it out at http://sachachua.com/blog/p/26117. If you give me your e-mail address (optional), I can invite you to check out the blog when it starts out. I’m going to brainstorm some headlines, fill in outlines, write posts, draw sketches, and get things going maybe a month or two in advance before I tell most people about it. Vote and tell me how to contact you, and you can help shape the way the blog evolves. =) Please fill in the poll by October 4, 2013 (next Friday) – I’d love to get things going quickly! You can benefit from summarized insights from books and blog posts. I speed-read and have access to an amazing library, so I can grab ideas from books you don’t have the time to read, summarize them in neat one-page graphical notes, and help you learn faster. Instead of generic advice, you can learn from stories and experiences. There are lots of platitudes out there: “Follow your passion.” “Spend less than you earn.” “Make something useful.” I don’t want to write generic run-of-the-mill link-building articles. I’ll tell you what it’s like to apply the advice to real life and what I learned along the way. I’ve got a lot of practice in thinking about what I’m thinking (including identifying and questioning assumptions), so I’d be happy to take you behind the scenes. You can explore interesting perspectives with me as we combine different experiences. There’s plenty of advice on how to make better decisions, but that’s even more fun when you can bring Quantified Self-type tracking and metrics to measure the results. Writing is a useful tool for learning, and it gets even better when you can tweak the software you use. 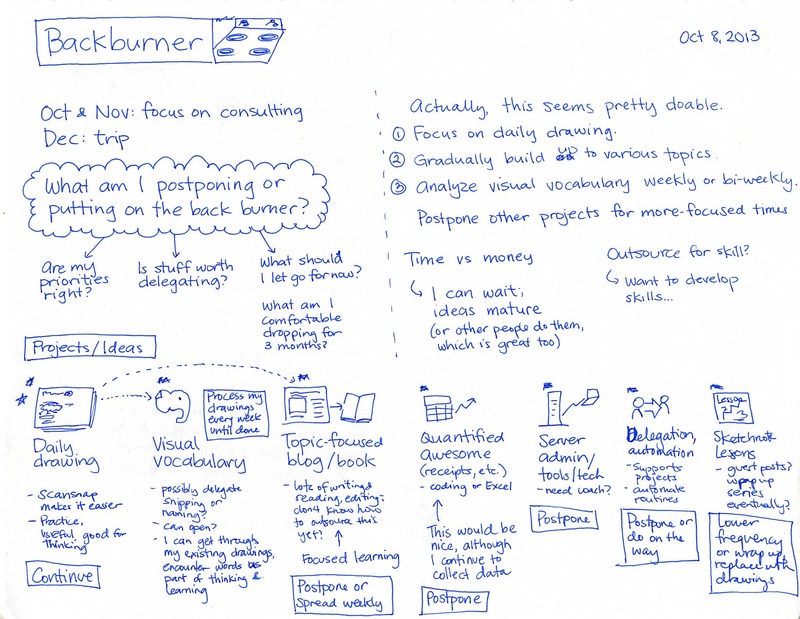 Learning complex topics can be difficult, but sketchnoting can make the ideas more approachable. I’m a geek, and that spills over into everything I do. So that’s why I’m thinking of adding a topic-focused blog to the abundance of content already on the Internet. I’ll probably branch it out under the “LivingAnAwesomeLife.com” domain name – maybe in a subdirectory for ease of expansion later on. Also, since it’s good to question one’s assumptions: Is there a better way to improve navigation and reduce overwhelming volume than a topic-focused blog? Have you come across other wide-ranging blogs that make it easy for you to focus on just the topics you want, while discovering “neighbouring” topics if you’re interested? What do those blogs do differently? Got any additional thoughts? Feel free to share them in the comments! I bought $289 worth of books, including pricey but useful books on drawing emotions and stick figures (Bikablo, from Neuland). I’ve made the most of them by reading, taking notes, and sharing what I’ve learned, so this was definitely worth it. I also took the AlphaChimp Rockstar Scribe course (CAD 298.66, it’s now USD 497; affiliate link). I picked up a few tips on digitizing scanned sketches (lesson 6: digital documentation). The exercises also prompted me to put together my 3-word life philosophy and my 5-year plan. Next steps: My laptop should be good for another year or two, so I have no major upgrades planned there. I may invest more into courses. These tend to be bigger commitments, but I think the experience might be worthwhile. I can test this by seeing if I can improve my retention in free or low-cost courses (Coursera, Udacity) before going on to more expensive courses. Gotta build up those study habits! If I find that I’m hitting the limits of what I want to learn in group classes and I’m already making the most of the Q&A or mentoring that courses tend to offer, then I can look into getting a one-on-one coach. The biggest chunk here was flying to London for the Emacs Conference, which was a great way to connect with people, create resources, and develop skills. I also signed up for HackLab ($51.75 a month) as a way to connect with other geeks and have a place to work at when I’m downtown. I attended networking events ($170.45). AndroidTO was less useful than I expected because I hadn’t actually been developing stuff then, although it was good sketchnoting practice. The Third Tuesdays Toronto events were definitely worth it for me. Rotman events were okay. I met four people for lunches/dinners and had lots of tea with others, talking about mentoring or business opportunities. I greatly increased my delegation budget compared to last year. I subcontracted $1,333.34 of my work and delegated an additional $2,030.30. Hiring a virtual assistant to help with scheduling really helped me get past the hassles of booking people. Worth it. Hiring a transcriber for my podcasts and presentations worked out well, too. Hiring a local consultant to help me brainstorm was okay, but not amazing. It was a helpful nudge to work on my marketing, though. Hiring another on-shore consultant to give me feedback on my website and e-books was also okay but not amazing. It was great for pushing me to add more hand-drawn elements to my website, though. Hiring a developer to work on Rails prototypes gave me a leg up on dealing with various APIs, although I ended up not pursuing the projects. Next steps: Virtual assistance gives me a low-cost way to experiment with and learn more about delegation. In addition to ODesk, I should experiment with Fiverr, Guru, and other sites. I made $90 in e-book sales in FY 2013, which absolutely delights me. 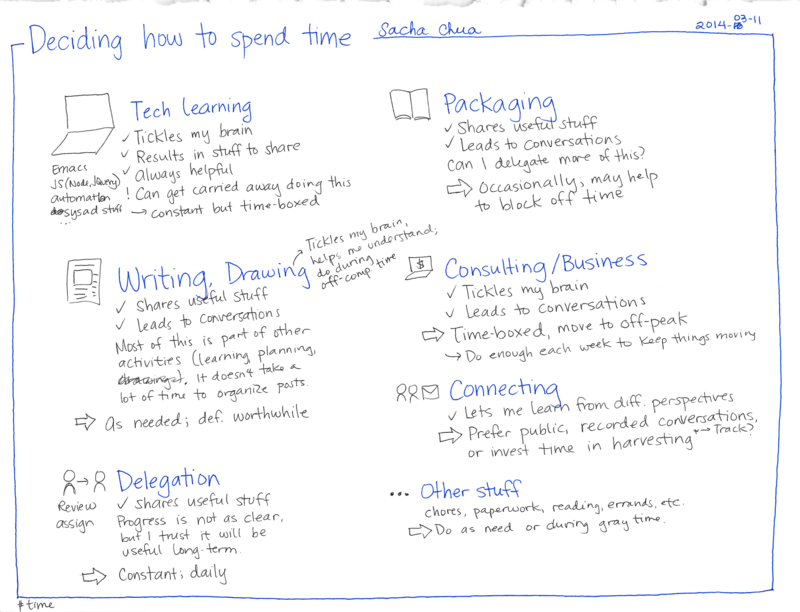 It’s a tiny fraction of what I make in consulting or even sketchnoting or speaking, but it’s a start. I’ve been moving towards a Pay What You Want model so that everyone can get access to the resources and people can show their appreciation by funding future experiments. My experiment-related savings take care of my living expenses, so everything goes to Making Stuff. I want to focus on making more things. For this coming year, I’m planning to focus on consulting until it winds down. I’m also going to ramp up creating content: blog posts, drawings, articles, e-books, courses, and more. I often get requests to sketchnote events or other people’s content, and I’d like to refer those to other people instead of handling them myself. That way, I can help other people grow, and I can make myself learn more about creating my own content. I might keep a "Wanted" list on my site so that I can funnel other requests to it, like people looking for sketchnoters. That way, instead of simply telling people no, I can help them a little further along the way and help other people grow their businesses too. Brainstorm headlines and article ideas to help me choose which topics I want to start a weekly topic-focused blog around. Get feedback on which topics people would like to read about first. Start collecting e-mail addresses for launch. "Bank" 4-8 good articles (write two months ahead). Invite early readers. Publicize it a bit more widely once I’ve gotten into the rhythm of publishing on the blog and I know that the rate is sustainable. Plan an outline for a brief e-book and gear my articles towards that. 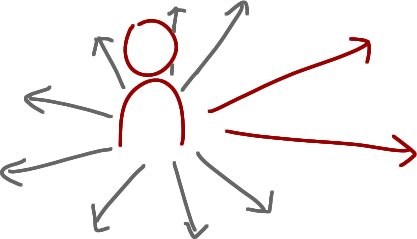 Reach out and find guest posting opportunities once the blog is more established. To make the blog different and useful, I plan to illustrate the ideas with one-page cheat sheets / references. This will also make a handy collection. With that in mind, what are some ways I can reinvest some of my profits in order to make things better, and which ways make more sense than others? These are ordered in terms of how useful I think they will be, with the best ones on top. I’d love your feedback and suggestions! Find a system administrator who can help me review my config and backup plans, and who can answer questions from time to time. As someone said, good judgement comes from experience, and experience comes from bad judgement. I can learn things on my own, but it’s probably really good to take advantage of other people’s hard-won experience too. That way, I have a solid platform to grow on. Go through a course like the ones offered at Platform University, CopyBlogger, or ProBlogger. I can get multiple levels of value out of this. First, there’s the lessons themselves. Even if I know most of the basics because I’ve been blogging for more than ten years, it will be good to deliberately go through them. I can turn them into blog posts about my experiences applying those tips. I can turn them into sketchnotes and references. Along the way, I’ll also learn about the structure of courses and communities – what I like or don’t like, and what other people seem to respond to. Sign up for a good mailing list service, possibly with an autoresponder or digital delivery mechanism. This will give me more control than simply using FeedBurner to give people e-mail updates. Sign up for survey tools so that I can get better feedback. Provide giveaways or incentives for survey completion. Experiment with richer media: presentations, animations, podcasts, video. Buy tools and hardware. Possibly delegate editing. Podcasts and screencasts might be a good way to work myself up to doing webinars regularly. Pay for a web conferencing service, and set up regular web conferences or webinars. Monthly webinars might justify paying for a premium service so that I’m not constrained by Google Hangout or AnyMeeting’s limitations. I can also use this to interview people. Any recommendations for a cross-platform webinar service that allows all participants to chat with each other? Work with a reputable SEO company to avoid penalties for duplicate content and to learn more about doing keyword research. Sometimes little tweaks make things more findable or discoverable. 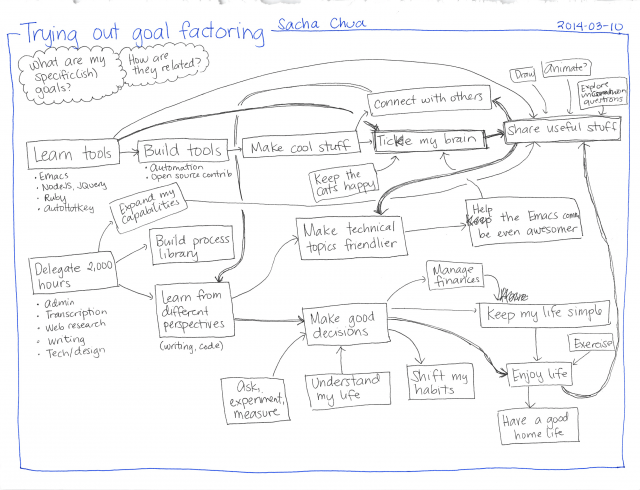 Invest in better web planning and design, maybe for the topic-focused blog. I might start off with a basic template, fill it in with content, add some resources, and then go for a more professional design when the topic and audience for the blog has firmed up a little. That way, I can get feedback from people too. Buy premium plugins, scripts, or themes to make navigating the blog or content easier. A responsive theme and a good gallery can make a lot of difference. Buy books, read them, and give them away. That way, I’m not limited to the library’s selection. 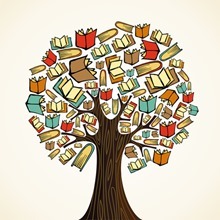 The library has lots of books and it could take forever for me to get through the backlog, but learning from and sharing tips from newly-published books may create more value for readers. Plus, if I set aside a budget for shipping (which is expensive in Canada! ), I can give lightly-read copies away. I’ve had publishers send me copies of books to review, so maybe I can ramp that up also. Hire someone to format e-resources. They can help develop the template, lay things out nicely, and make sure it fits in well with the blog. Learn how to work with article writers or pay for excellent guest posts. I have the time to write and I enjoy writing, but I’m curious about the perspectives that other people might bring. Worst-case scenario: They write the first draft, and I end up rewriting it extensively because I have a better idea of what I don’t want. Best-case scenario: I give them a topic to write about, they come up with insights or research I might not have come across myself, and then I can personalize it with more stories or experiences. Work with copywriters and editors and get better at writing. Hire a coach to help me learn more about planning posts, creating resources or courses, building a community, and so on. Buy domain names and learn how to set up landing pages. 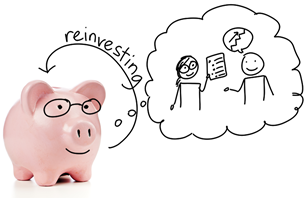 Do you have any suggestions on where you think I should invest more money, business-wise? Are there things on my blog where a little money can have high impact? Please share your comments below, or e-mail me at [email protected]!